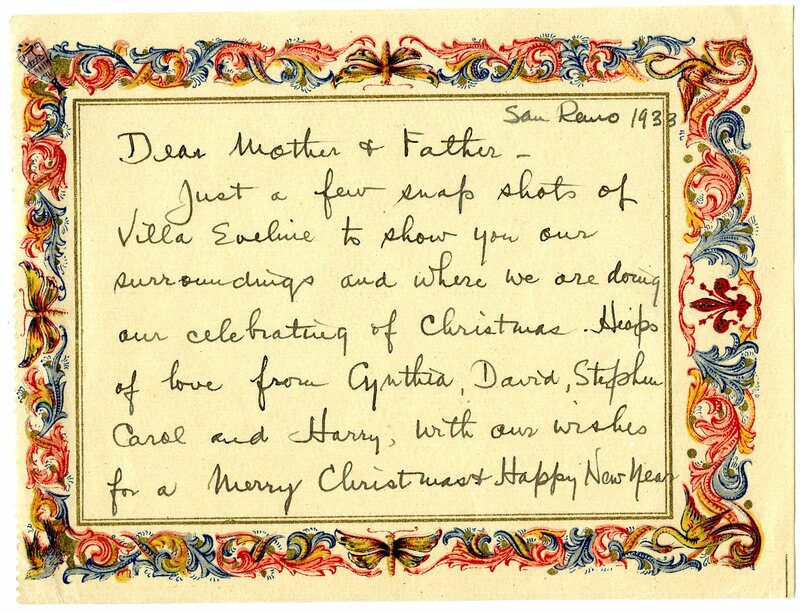 Henry and Carolyn Booth spent the Christmas of 1933 at the Villa Eveline in San Remo, Italy with their children Stephen (8), David (6) and Cynthia (10 months). In Henry’s letters home he writes about the traditions he and Carolyn tried to maintain while spending Christmas away from home. He also writes about the “rustle of palm trees” in their garden and the crowds of people gathering at the churches on St. Stephen’s Day – a national holiday in Italy. 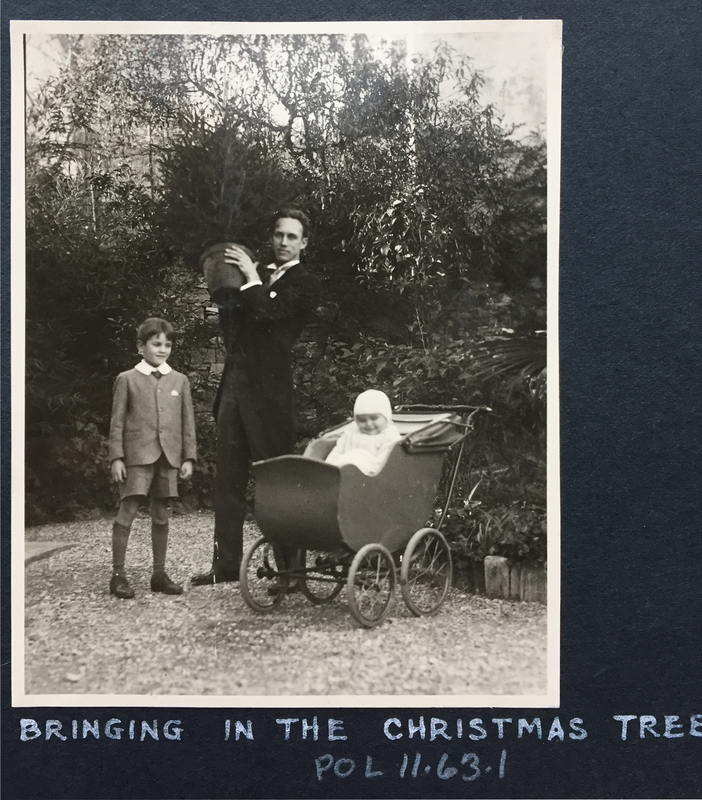 Henry Scripps Booth carrying the Christmas tree with Stephen and Cynthia (in stroller), 1933. Holiday wishes from Henry Scripps Booth to his parents, Ellen and George Gough Booth, 1933. The photos sent home are both formal and candid – very much like posed photos captured on photo cards today, as well as informal images of families and friends enjoying time together at the holidays. My favorite shows a very happy Cynthia following Christmas dinner! 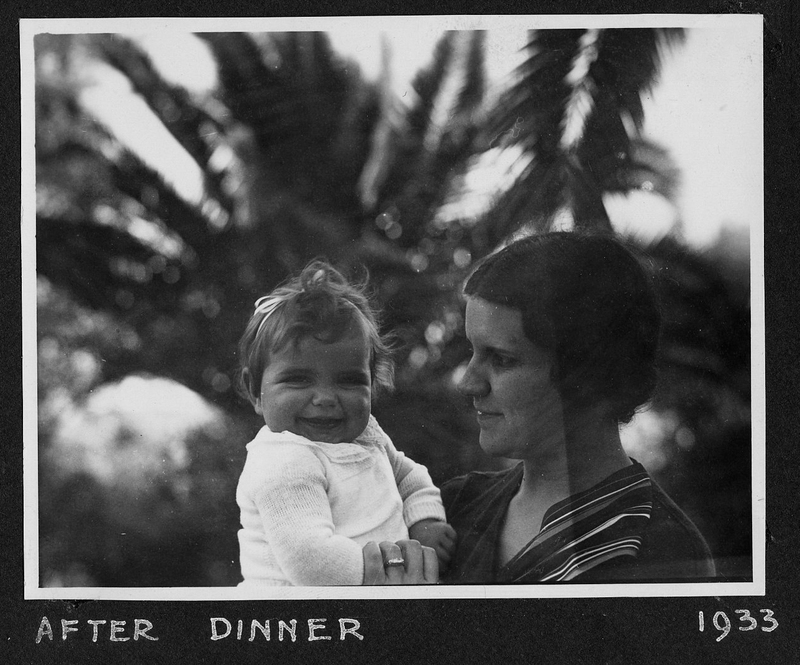 Cynthia and Carolyn Booth, Dec 1933. 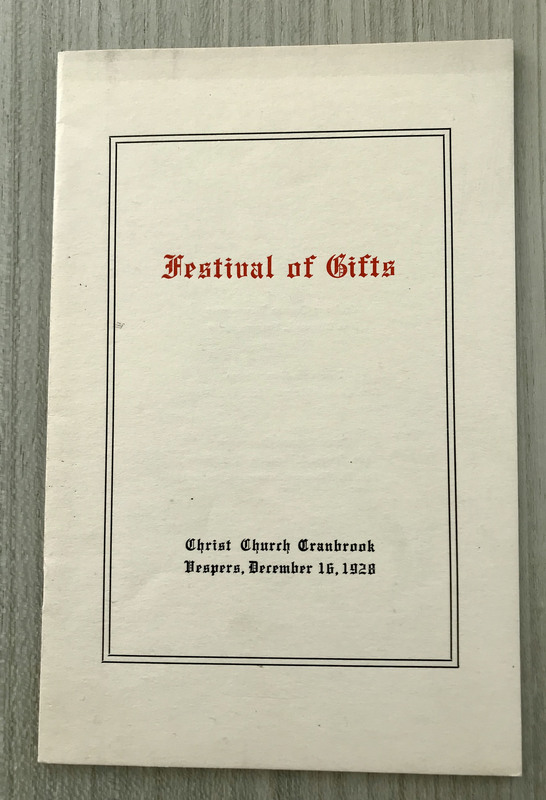 Festival of Gifts order of procession and liturgy, 1928. Courtesy Cranbrook Archives. The Festival of Gifts is an adaptation of the St. James play, with a procession of the entire congregation to the nativity tableau followed by the entrance of the Holy Family, shepherds, and wise men as the story of the birth of Christ is read. As the congregation proceeds to the altar they lay gifts at the manger, which are then distributed to local families in need. Festival of Gifts procession, Dec 1945. The nativity tableau, Dec 1945. Some of the original festival costumes were re-purposed from the 1916 Cranbrook Masque and others were purchased by Henry Scripps Booth in Tunisia in 1922. Originally a doll was laid in the manger, but at some point, the decision was made to cast an infant from the parish. Animals have also been a part of the event, however, according to Henry Scripps Booth, “Brighty” (star of Stephen Booth’s movie Brighty of the Grand Canyon) made the greatest impression! In a corner of George Booth’s Old Country Office, there is a door that opens into a blank wall. I became curious about this door to nowhere last year when I was setting up the Center’s holiday display, and so this year’s Christmas scene is inspired by the door’s original purpose. Around 1919, Booth purchased a blue and yellow macaw and named him Mack. Mack, like all parrots, enjoyed chewing things—Booth’s picture frames, furniture, and the walls themselves. Booth thought getting a second macaw, which he named Jack, might calm Mack’s chewing, but alas, he simply doubled the trouble. 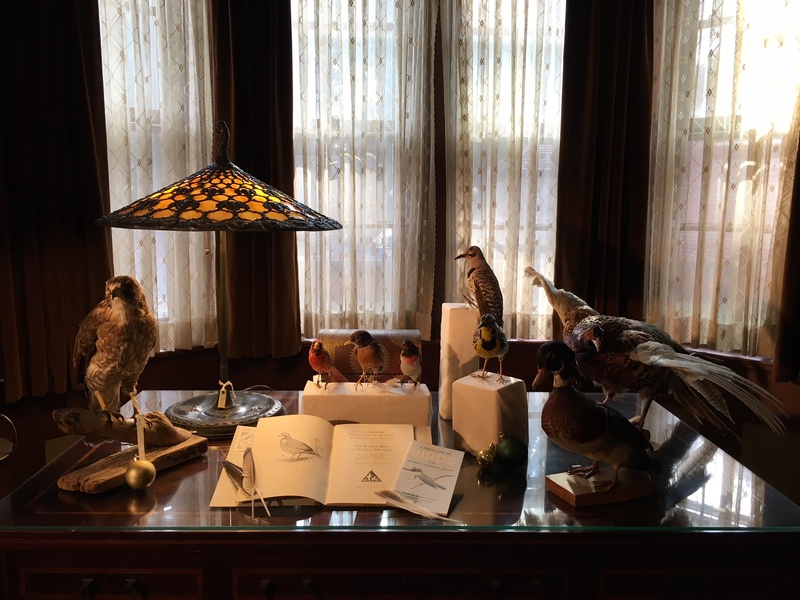 In early 1920, Booth added a flat-roofed glass walled aviary outside of his office to give Mack and Jack their own space (and save the furniture). It was bound by the exterior walls of the office, living room, and library. Accessed through a door left of the fireplace, Mack and Jack were joined by canaries in the aviary, and according to Henry Booth’s memories, every time the canaries sang or the telephone rang, the macaws’ squawk would fill the house. This ca 1925 view of Cranbrook House shows the exterior window of the aviary, covered with a cabana striped awning, between the bay window of the office and the library wing. Courtesy Cranbrook Archives. Eventually, the Booth’s gave Mack and Jack to the Belle Isle Zoo. The canaries remained for a time, cared for by one of the maids, Harriet. When she retired, the aviary was disassembled and the window was reused as a kitchen window for Brookside School, where it remains. 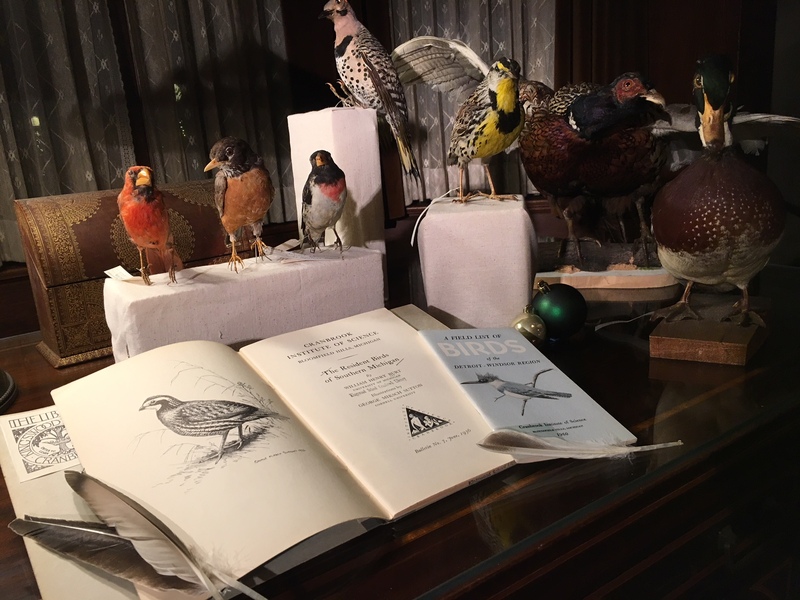 For my holiday display, I’ve opened the door to the aviary and staged a scene as if Mack and Jack were just here: destroying a book and leaving their feathers all around. You can find the canaries enjoying themselves around the Christmas Tree. 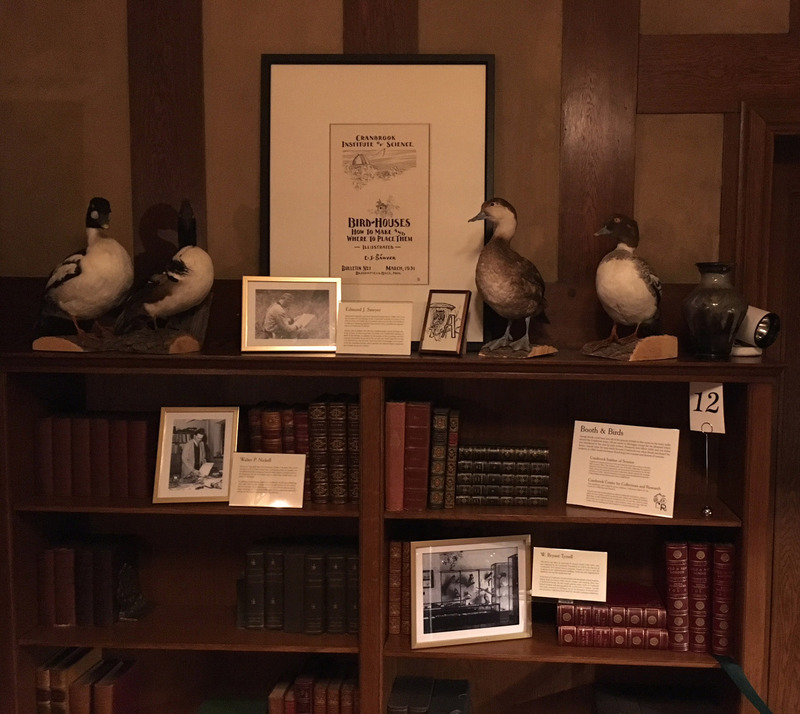 Also on display in the office, is a series of birds that Booth could have seen on his many walks around the Cranbrook estate–hawks, cardinals, robins, and plenty of ducks (on loan to me from Cranbrook Institute of Science). All are native to Michigan, except for the pheasant which would have been introduced to the area by early settlers. Pheasants, however, love fallow fields and run-down farms—exactly what the land which became Cranbrook was when Booth purchased the property in 1904! Alongside the taxidermy I’ve included pieces from the Cranbrook Archives: early copies of Institute bulletins on the Birds of Michigan, original artwork from an ornithogist working at Cranbrook in the 1930s, and photographs and short biographies of other bird-related Cranbrook people, like W. Bryant Tyrrell, Walter P. Nickell, and Edmund J. Sawyer. Come and see the Office display this weekend (December 1-3) for the House and Gardens Auxiliary’s Holiday Splendor event (Friday, 10-4pm, Saturday 9-4pm, and Sunday 12-4pm), visit it with me next Wednesday before or after the Center’s Järnefelt Piano Trio: Jean Sibelius Concert, or at any of the other Cranbrook House events before January 8th. 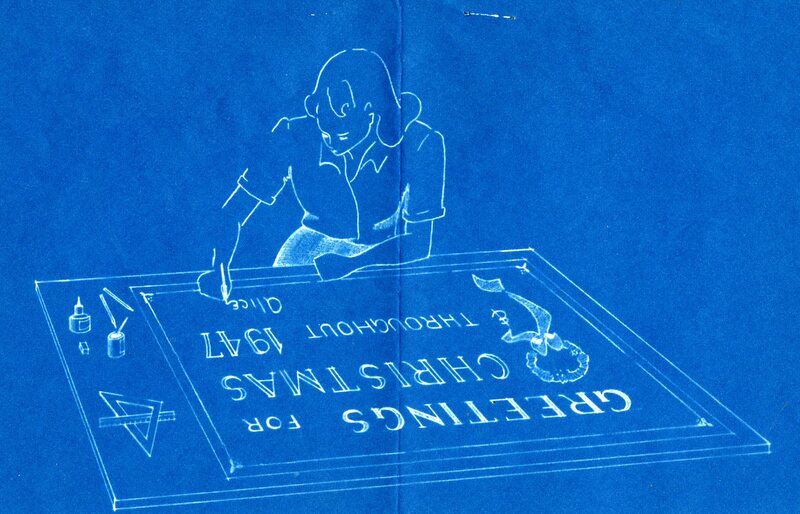 Last week a researcher came to look for holiday inspiration in the Archives. As I was putting the materials away, I came across this lovely card by Academy of Art student, Alice Warren. The card piqued my interest and I did a little digging to learn more. Holiday card from Alice Warren to Margueritte Kimball, 1947. Margueritte Kimball Papers, Courtesy Cranbrook Archives. 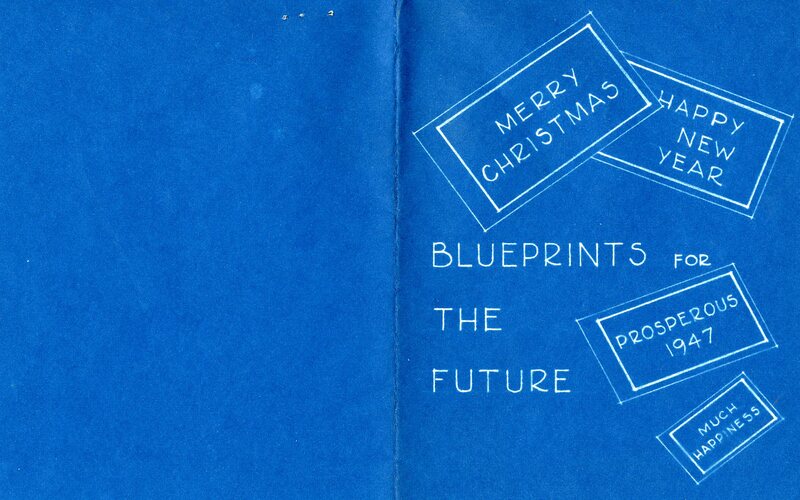 Inside design of holiday card from Alice Warren, 1947. Warren, born in 1921, came to Cranbrook to study architecture with Eliel Saarinen in 1943-44. Warren’s father (Don) was a genetics professor, and her mother (Mira) assisted him with his lab work. In 1920 Don Warren, with Mira’s assistance, published three scientific papers about his genetic research of the fruit fly. Professor Warren went on to become a pioneer in poultry genetics, earning several awards and distinction in this field. Alice Warren, like her parents, was a trailblazer. In 1942 she graduated from the University of Illinois with a B.S. in Architecture. In May 1943, she wrote to Henry Scripps Booth expressing her desire to come to Cranbrook for a summer session to “further [her studies] under Eliel Saarinen.” She received a letter of acceptance in June. While at Cranbrook, Warren studied Architecture and City Planning. As part of a team (Annette Kite, painter and Eliza Miller, sculptor), her work was entered in the 1944 Rome Collaborative – an annual competition conducted by the Alumni Association of the American Academy in Rome. She later worked for Saarinen, Saarinen and Associates. Warren also met her husband, Fred Dockstader, while studying at the Academy. Dr. Dockstader taught history at Cranbrook School from 1943-52, and designed ethnological exhibits at Cranbrook Institute of Science in 1951-52. 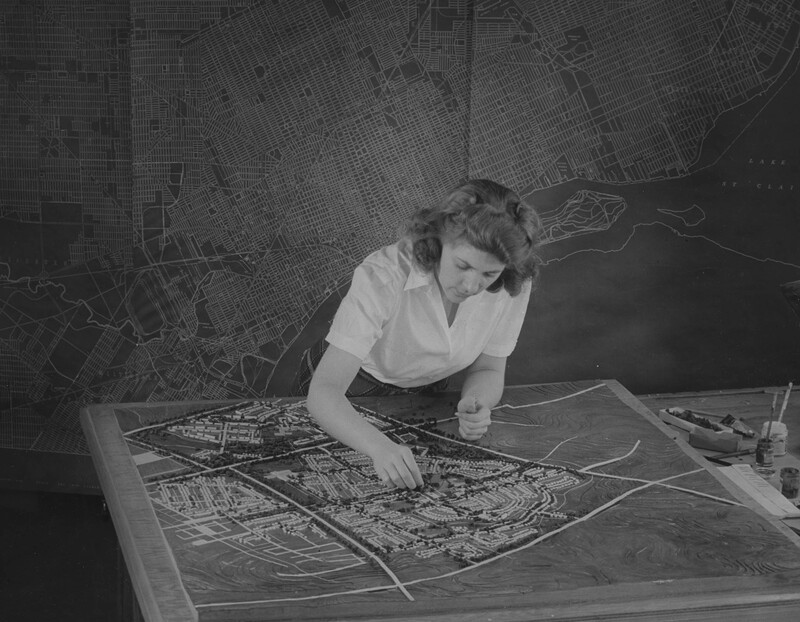 Alice Warren working on her city planning model for Plymouth, MI, 1944. Photographer, Harvey Croze. Courtesy Cranbrook Archives. Warren and Dockstader married on Christmas day, 1951. Dockstader was an anthropologist, art professor, and a noted authority on American Indian art. The couple worked together on several publications and also at the Museum of the American Indian in New York, where Alice was a staff architect, and Fred was the museum director from 1960-1975. Author’s Note: While researching Alice Warren Dockstader, I came across the finding aid for the Frederick Dockstader Collection at the Arizona Archives. One of the content notes describes holiday cards designed by Alice and Fred that incorporate their interest in Kachinas. You can see one of these on the Cranbrook Archives Facebook page! 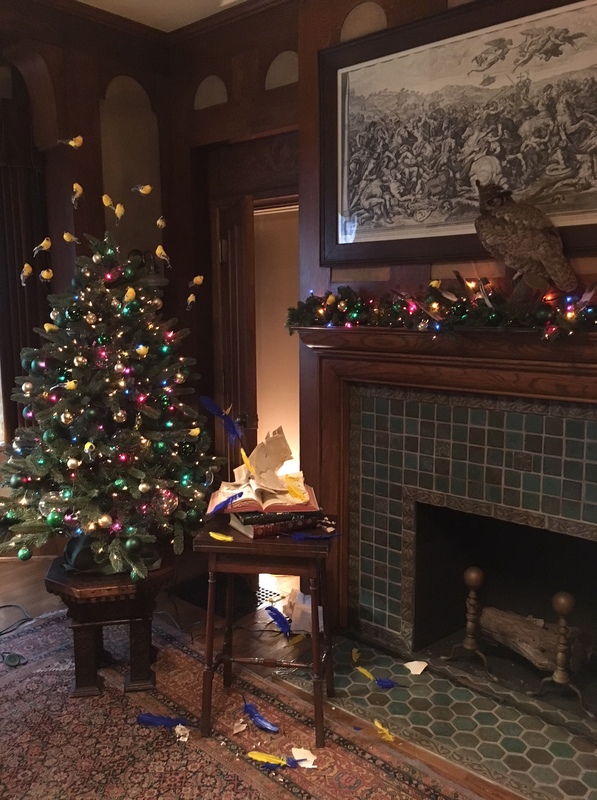 Every year, the Center for Collections and Research decorates George G. Booth’s Office for the Cranbrook House & Gardens Auxiliary’s Holiday Splendor event. This year, we were inspired by the Booth children and grandchildren. Some of the Booth grandchildren put on a play at George and Ellen Booth’s 50th wedding anniversary, 1937. Courtesy of Cranbrook Archives. All children enjoy playing “dress-up” – whether in a costume or in the clothes of a family member. For George and Ellen Booth’s family, especially their youngest children Florence (“Smike”) and Henry (“Thistle”), any occasion was an excuse to dress-up – a family picnic, a visit from family or friends, the arrival of a new boat for Glastonbury Lake. 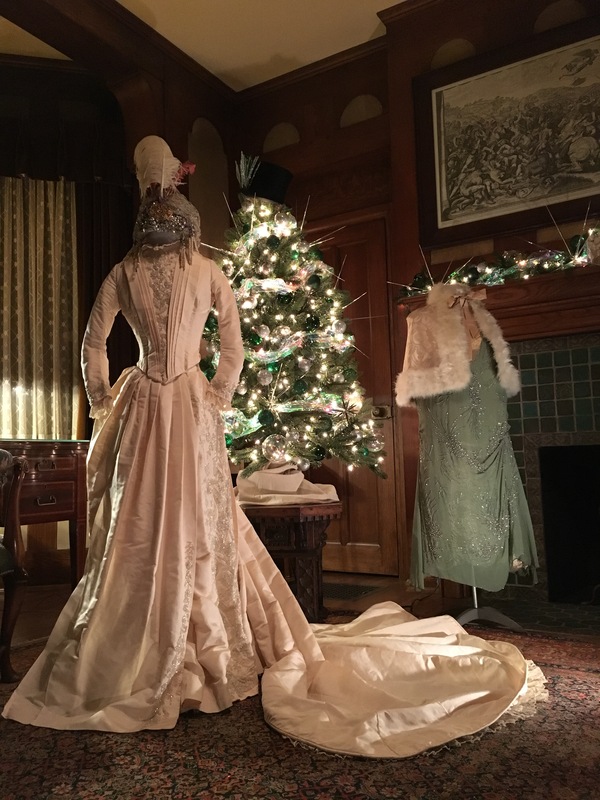 For this year’s holiday installation, we imagined the Booth grandchildren playing dress-up with clothes from their grandparent’s closet—their grandmother’s dresses and hats, costumes from performances at the Greek Theater, and other items stored in the vast closets here at Cranbrook House. Perhaps they’re putting on a play, as they did for their grandparents’ anniversary in 1937, or maybe they’re simply celebrating and having fun, as Smike and Thistle were so fond of doing in their youth. 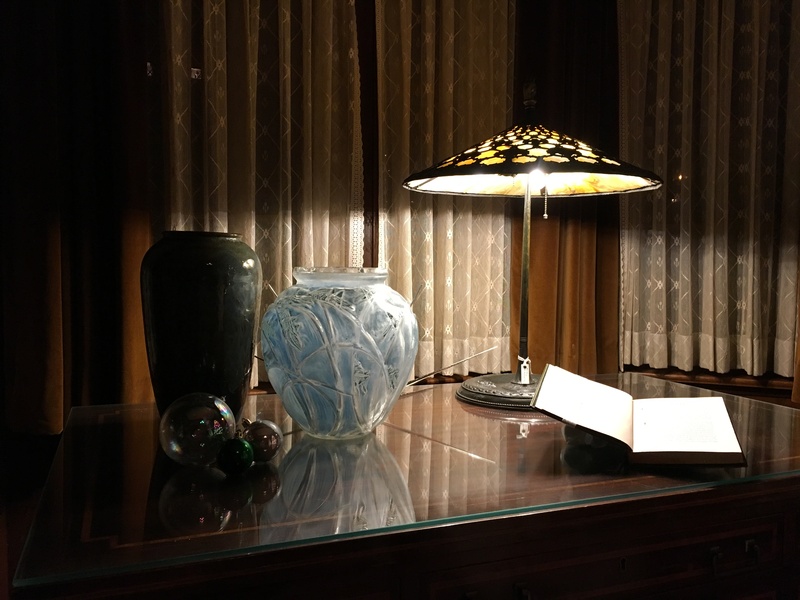 Accompanying the five outfits, the Center decorated a small tree and the mantle with iridescent, green, and silver ornaments, drawing out the colors of Florence Booth’s green dress and a beautiful Rene Lalique (1860-1945) glass vase (before 1930) we’ve set out on the desk. 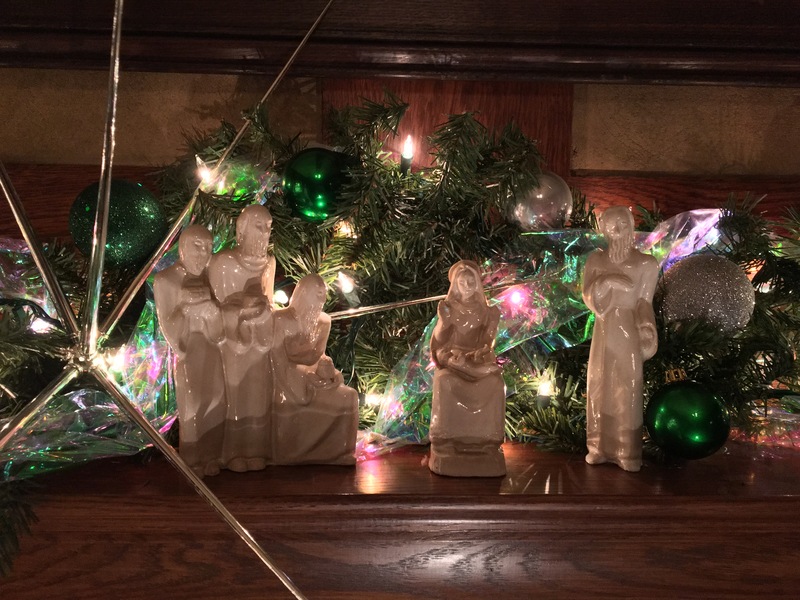 In the center of the mantle we’ve displayed Henry Scripps Booth and Carolyn Farr Booth’s Nativity (mid-20th century), sculpted by Clivia Calder Morrison (1909-2010). A Michigan native, Calder Morrison studied at the Detroit Society of Arts and Crafts with Samuel Cashwan and later at the Art Students League in New York, and this small crèche featuring the three Magi with gifts, Mary holding Jesus, and Joseph was kept in the oratory at Thornlea. 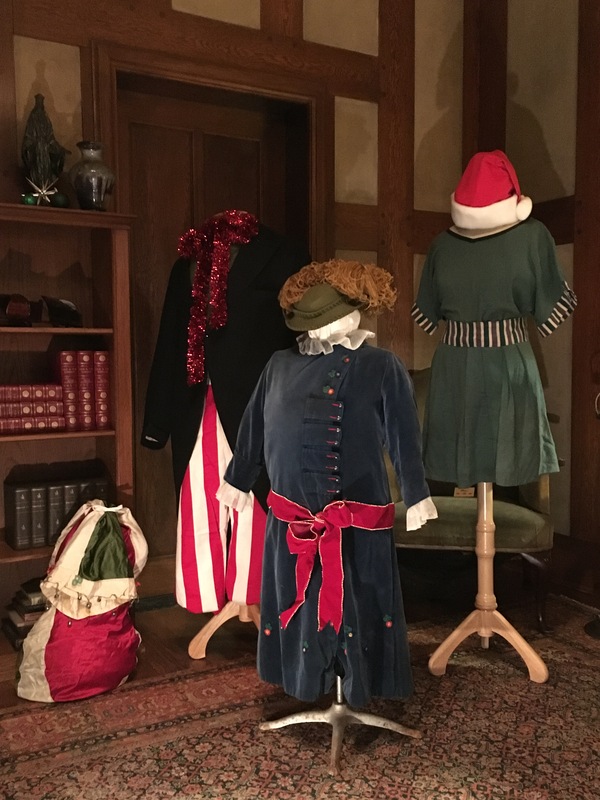 Oh, and the Santa bag and hat on display were part of Henry’s costume he donned for Christmas parties here at the House! Our display will be up through the New Year. If you are in Cranbrook House for the Center’s piano/violin concert & book launch, Carl Milles’s Muse: Ludwig van Beethoven on December 11, or a Holiday Tea, Luncheon, or just for a meeting, please stop by and visit.